It was acceptable in the 80s: A fancy dress charity event gave me a chance to haul the Denon DJ MCX8000 out of the studio to gig-test it. A friend of Digital DJ Tips here in Gibraltar recently took it upon himself to raise money both for a UK cancer charity and for a young boy locally who needs a lot of medical care. 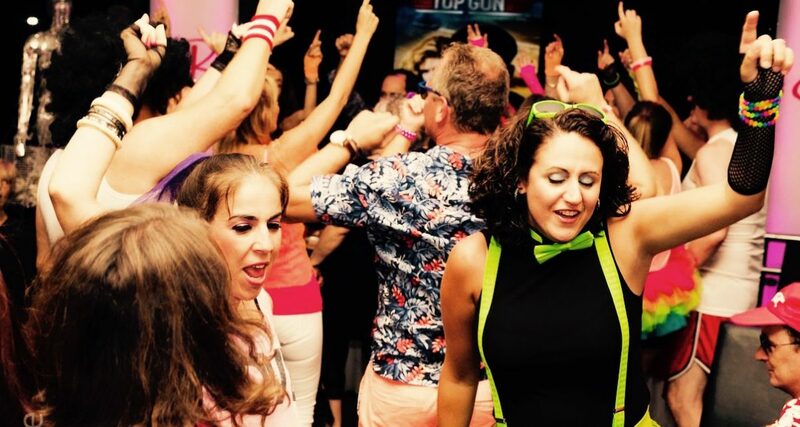 As part of his efforts, he decided to run a half marathon with a friend, and they threw a 1980s-themed party to raise money for the cause. 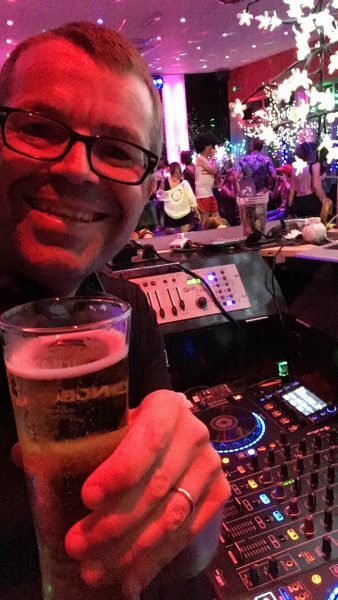 The gig was in a big cocktail bar/club, with its own DJ booth and dancefloor, decent lighting and sound, so I knew it’d be fun – plus getting to play what I consider to be the good music from the 1980s was something I couldn’t turn down. Of course I checked out with the venue first what the set-up was technically, but when I first got there, it was a definite squeeze physically to fit into the DJ booth with the rather large MCX8000. They had a couple of ancient CDJs and a Pioneer mixer, and when I tucked the mixer off to one side and put the CDJs under the booth, there was just enough room to slot the MCX8000 into place. A few more inches and I’d have been in trouble, though. I had tested everything at home first, but for some reason, when I plugged the MCX8000 into my laptop, the controller wasn’t recognised and Serato DJ remained in offline mode. This has happened before with that laptop (with the Denon DJ DS1 DVS interface), but as I’d had it all working fine at home, I decided the issue must be something else. After trying the other USB socket on my Mac (no help), I finally plugged the MacBook and the MCX8000 into different electricity sockets. Bingo! It all worked properly. The very best bit about that whole episode (apart from keeping calm and working through all possibilities – something I’ve had to do many times over the years), was knowing that in my back pocket I had a USB stick with my whole set on it, prepared in Denon DJ’s Engine software. 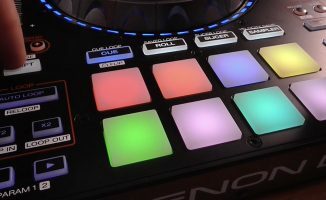 With the MCX8000, you can also DJ from USB using the built-in screens, so I was safe in the knowledge that should I have to, I’d be able to do just that – it wouldn’t have been perfect, but it would have been a lot better than nothing. Anyway, there were no more issues – although I’ve never got to the bottom of why the laptop sometimes behaves like that. The differentiating factors with the MCX8000 and most controllers are, I guess, its size, the screens, and the Engine software for preparing a set on USB. As you’ve just learned I didn’t end up having to use Engine, and once the unit was squeezed into the DJ booth, the size actually became a bonus (people admired the MCX8000 approvingly). I did choose to switch the rotating lights on the jogwheels to have one light on and the rest off, rather than one light off and the rest on, as I felt it appeared less garish that way, but overall, the thing looks and feels like it means business. After a while I realised I didn’t like the backlighting behind the buttons, which was most obvious on the channel cue buttons. Because they are backlit permanently (which makes sense, because it means you can see them in the dark even when they’re not turned on), the way they work is that when you press a button, it gets brighter to indicate it is “on” not “off”. The issue is that the difference between “off” and “on” brightness isn’t pronounced enough, so effectively, you don’t know if a button is on or off without trying it. 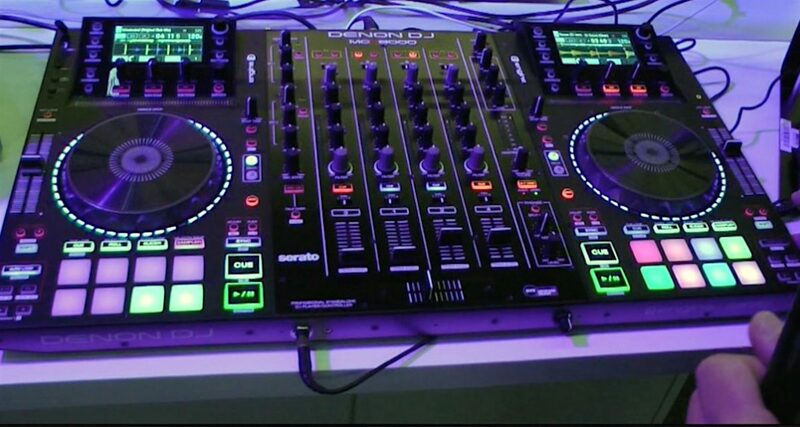 I suggest Denon DJ should either change this permanently in the next firmware upgrade, or do what some other brands do does and have an adjustable backlight brightness (as a knob or in the set-up menu) that lets you set this to where it works for you. Apart from that, the controller was fantastic: the jogs are large and responsive, the mixer reliable with all the controls nicely sized and well spaced, and the microphone channels (I only used one, mind) clear and controllable, which was just as well as I had to deal with feedback from the speakers when the hosts were thanking everyone for coming. The jogs are large and responsive, the mixer reliable with all the controls nicely sized and well spaced, and the microphone channels clear and controllable. Personally, I actually found the screens to be of limited use. The library browsing is vastly inferior on a small, unsortable 7″ screen list compared to the huge list on the laptop screen, and having waveform and other info in the controller was to me a bit of a distraction. 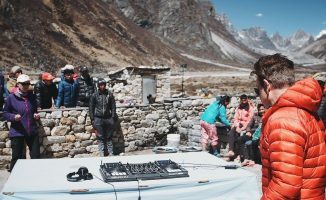 I have no issue with using the laptop anyway, and while I appreciate the screens need to exist (for the wonderful Engine backup solution), it would have been nice to be able to just switch them off with Serato DJ – giving the best of both worlds. Anyway, back to the night: by midnight the dancefloor had been full for hours, people where whooping and cheering (song of the night: Pump Up The Volume by MARRS), and I had forgotten completely about what gear I was using, and was simply lost in picking the best tunes I could find to keep the night rocking… exactly how it should be. The MCX8000 is a solid controller that people will take seriously. Especially if you are cautious like me and want to have a full backup solution with you, its Engine alternative DJing system means you can achieve that simply by taking a USB drive with an Engine-analysed library on it, rather than a whole redundant system – which is very cool. It’s definitely a big controller so you’re going to want to think about whether you may be asked to play places where it’s hard to set it up. You may – like me – also end up deciding that on-device screens are unnecessary in addition to a laptop. 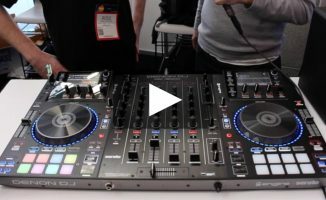 But if you want a flexible, professional and impressive controller for the heart of your mobile, party or portable DJ set-up, you need to have the MCX8000 on your list. With just a few tweaks to the firmware, it’d go from very good to close to perfect. Yes, those controllers are *too big*. One reason I like Reloop’s Mixtour, I could sneak it in just anywhere including tight radio station studios. True in a way of coarse, but to easily put the other setup at the side the booth/desk should be at least twice the size of that setup! 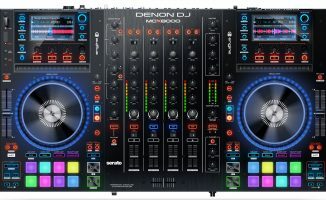 Wouldn’t a Denon MC7000 and a second laptop be a good alternative? The MC7000 had dual usb connections so you can connect two laptops. For the price difference between the MCX8000 and MC7000 you could buy a decent new Windows laptop or second hand MacBooc. I love mine. Except same gripe about the CUE buttons, I can’t tell the difference between on and off. The control button light intensity was another reason for my shift to Virtual DJ 8 with myt Denon MC6000 Mk2, I think this is a MIDI mapping issue within software as to how bright the buttons are, particularly the CUE buttons in Serato. VDJ8 is definitely more on the case with this. Try the demo for comparison, I think it works fully for evaluation before licence purchase, but limits usage time so that it cannot be used professionally without a licence. It’s been a while since I did this but worth checking if you are interested. I’ve never seen Serato do that before. anyone know if this unit provides any power to a dynamic microphone when plugged in? Or do you need to use a dynamic microphone with replaceable batteries? I was looking at the Behringer Ultravoice Xm8500 but it doesn’t seem like it will work since it does not have internal batteries. No, it doesn’t provide power for dynamic mics. dynamic mic don’t need power, condenser mic require phantom power. (you probably don’t want to use a condenser without proper outboard gear as they are more prone to feedback. Phil, i’m looking at adding/moving from Traktor S8 to Serato for mobile and am trying to decide between the MCX8000 or the MC7000. i like the screens on the S8, but wonder if i’ll feel the same on the MCX8000 or is it just better to position my laptop better. (been experimenting with putting it under my S8 and using a USB keyboard/mouse.